The decoys Crowell created for Harry Vinton Long are among the carver’s best. The group includes this preening Canada goose, which traded privately for $1.13 million, the top reported selling price, along with the Phillips preening pintail duck, for any decoy. HINGHAM, MASS. 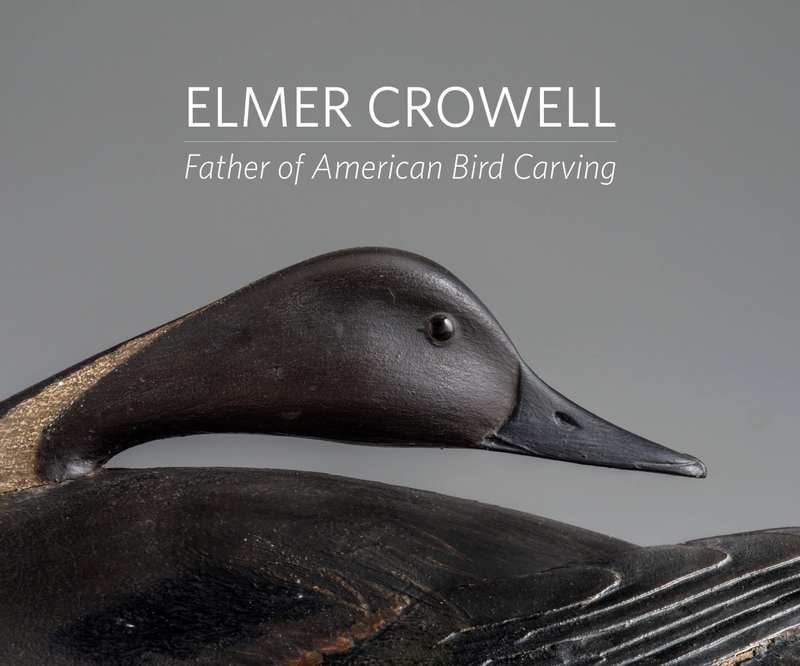 – Authors Chelsie W. Olney and Stephen B. O’Brien Jr, owner of Copley Fine Art Auctions and Stephen B. O’Brien Jr Fine Arts, LLC, plan to release Elmer Crowell: Father of American Bird Carving later this year. This limited-edition book tells the story of A. Elmer Crowell (1862-1952), a passionate hunter and decoy maker. By detailing the long life of one man, the authors etch a historical perspective on one of the most authentic forms of American folk art. 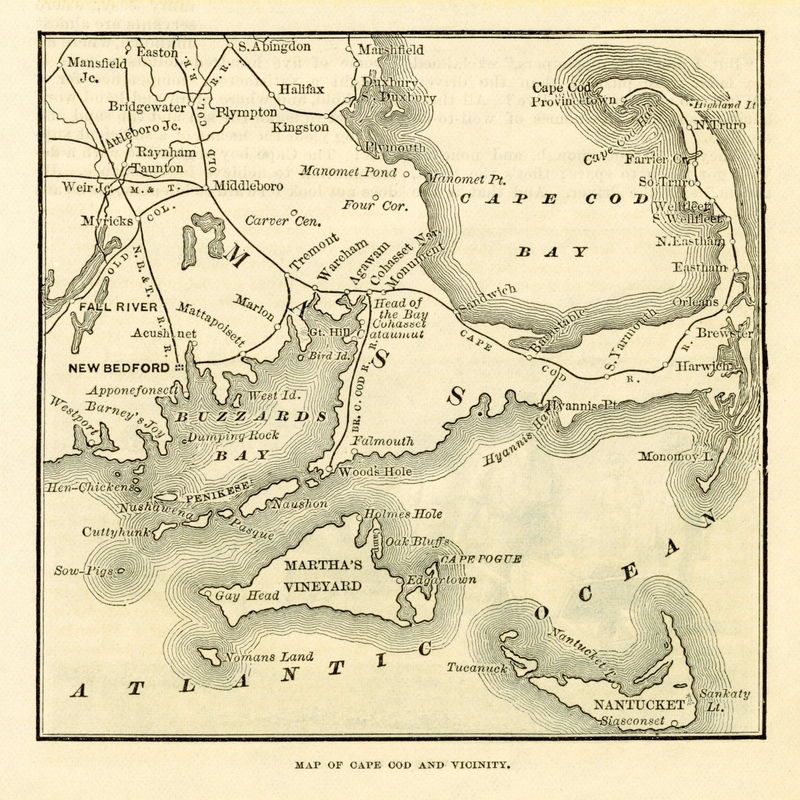 The book begins with the history of Crowell’s lifelong home, Cape Cod. With one of the largest barrier beaches in the world, the Cape is ideally situated for migrating waterfowl, shorebirds, songbirds and fish. It is an important stop along the Atlantic Flyway for some of the greatest bird migrations in the world. With the profound changes brought about by the American Industrial Revolution, access to these abundant natural resources increased. For Crowell and other hunters, the development of the railroad opened a new corridor to Cape Cod, enabling hunters to readily deliver their game to market. The continual improvements to America’s modes of transportation made it easier for customers to make their way to Crowell’s workshop and, conversely, for his decoys to take wing further afield. Cape Cod’s subsequent transition into a tourist destination would provide the carver with his future client base. From the beginning, Crowell loved the outdoors, birds and hunting. At age 12, he received his first gun and quickly learned to shoot well. By 14, he was yielding impressive numbers for a young gunner. With the increased demand for game birds, Crowell’s passion turned into an occupation. His strong desire to discover the best way to lure in waterfowl led to the development of his carved, wooden decoys. Crowell channeled his energy into the meticulous carvings that are so coveted today with the help of several patrons. His initial benefactors were predominantly men and women of means, accustomed to being surrounded by beautiful objects. His early clients recognized his skill as a live decoy handler and would later realize the maker’s extraordinary carving and painting abilities. With the guidance of his patrons’ vision and support, his decoys gradually evolved from practical hunting tools to inspiring works of art that would never touch the water. Around 1898, the Three Bears – Charles Ashley Hardy (1874-1929), G. Herbert Windeler (1860-1937) and Loring Underwood (1874-1930) – established a hunting camp at Pico Point on the south shore of Pleasant Lake, about a half a mile west of Crowell’s stand. Having heard the sounding shots of the young gunning phenom, they wisely hired Crowell to be their stand manager rather than competing with the experienced market gunner. 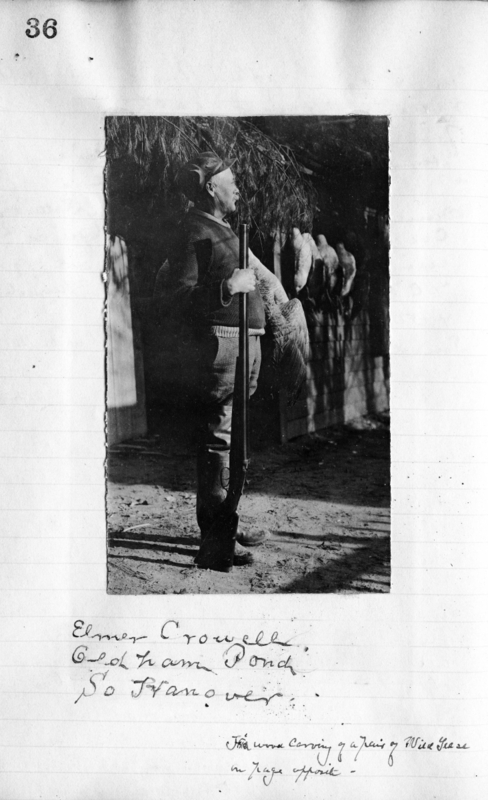 Crowell’s employment at the Three Bears’ hunting camp entailed procuring and then caring for a flock of approximately 50 live goose decoys. 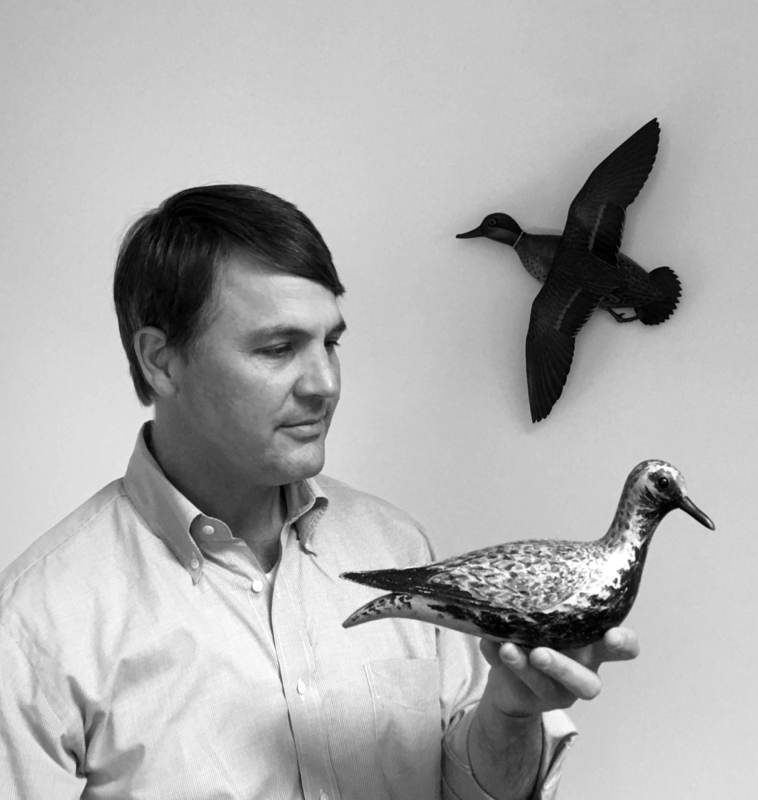 Over the years, Hardy commissioned Crowell to carve many exceptional decoys, including a Hudsonian curlew, a common snipe and a pair of bobwhite quail, along with at least five other life-size mantel birds. 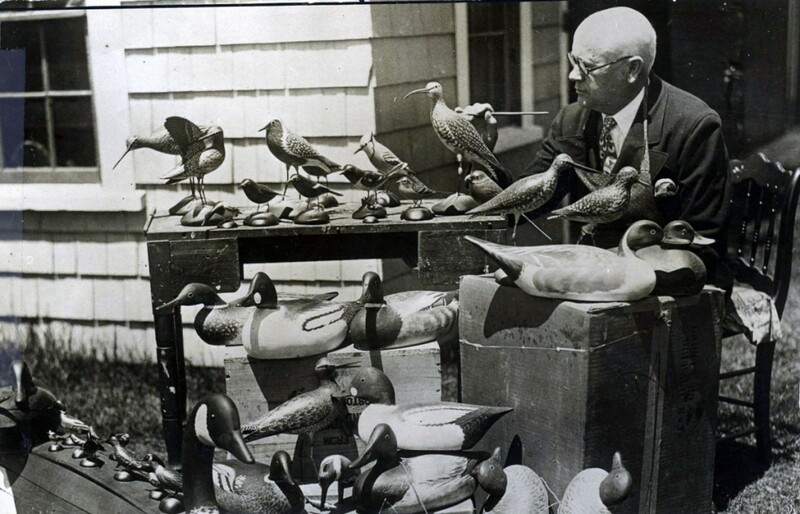 Dr John C. Phillips (1876-1938), of Boston and Beverly, Mass., also had a profound impact on Crowell’s career, both as a gunning-stand owner and a decoy collector. John Phillips Sr met Crowell when hunting on Cape Cod in the late 1800s. The young Phillips found a kindred spirit in Crowell, a passionate duck hunter who was continually experimenting to find the best means of luring in waterfowl. Phillips hired Crowell in 1900 as a gunning-stand manager at his Wenham Lake property designed by world-renowned landscape designer Frederick Law Olmsted (1822-1903). On the Phillips family property, Olmsted combined scientific agricultural methods with experimental forestry to create a gentleman’s farm. The property featured a stable, barn, gatehouse, henhouse, greenhouse, lawns, hedges, rustic stone walls and an enormous meadow. Crowell opened up the hunting camp in September, repaired blinds and pens, cared for the live decoys, baited the lake with corn, alerted guests of approaching flocks and closed the camp when the lake froze over, usually in December. Between these duties, he whittled some wooden decoys that delighted Phillips and his hunting guests. Soon after, Crowell began carving working decoys and decoratives for Dr Phillips and his friends. Crowell’s success at Wenham Lake led the doctor to hire him to run his Pembroke gunning stand on Oldham Pond in 1905. Although Crowell stopped working as a camp manager for Phillips after a decade, their friendship endured well beyond his employment, and the doctor bought decoys from Crowell until his death. While Phillips may have been Crowell’s most important patron, the carvings expertly crafted for Harry Vinton Long (1857-1949) were among his best. Similar to the Phillips family, the Longs were considered Boston Brahmins, with ancestry tracing back to New England’s earliest settlers. More important, both men shared a deep and enduring love of birds and the carvings of Elmer Crowell. Crowell puts finishing touches on a meticulously carved curlew. Long owned a coastal hunting haven called White Head. Jutting out into Cape Cod Bay, this rocky island in Cohasset is ideally located for bird watching. It afforded terrific shorebird and duck shooting just steps from the house. Long kept a comprehensive journal of his various bird sightings and first mentions Crowell in his writing in 1913. 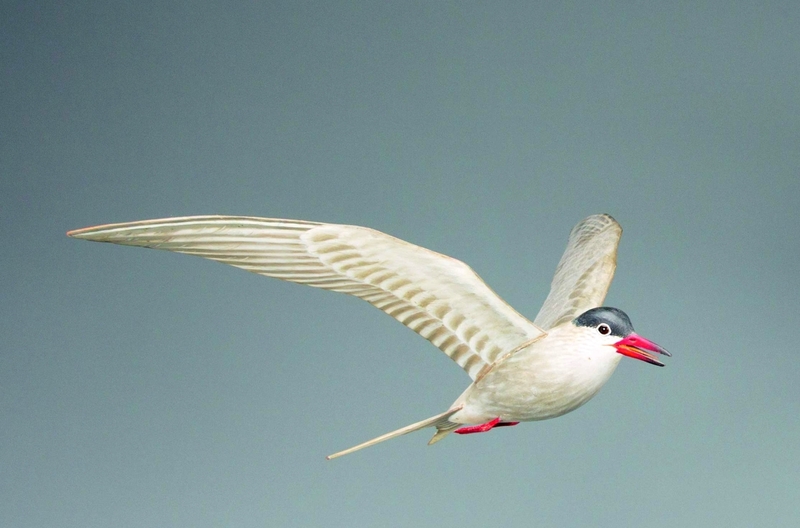 Some of these records are published in O’Brien’s and Olney’s book and provide a rare look into the life of this ardent birdwatcher, hunter and fisherman. As a passionate collector with a mission in life to preserve Americana, Long’s identification of Elmer Crowell as a national treasure comes as little surprise. An early collector of furniture, paintings, decoys, Audubon prints, Benson etchings and books, Long sought the finest examples. Consequently, the decoys Crowell carved for Long are among the best he produced. The tucked-head merganser drake, swimming black duck, nesting Canada goose, preening Canada goose, flapping Canada geese and preening pintail drake are all commissioned pieces and pinnacle works. An important and influential patron of Crowell’s for decades, Long sang the carver’s praises, ever widening his circle of buyers. While Hardy, Phillips and Long represent three major influences in Crowell’s life, and much has been written by or about them, they were by no means the carver’s only important benefactors. The list of early Crowell patrons also included Dr John Henry Cunningham (1877-1960), Roland Crosby Nickerson (1859-1906), Parker “Buck” Williams Whittemore (1872-1959), John Ware Willard (1859-1914) and Stuart Miller Crocker (1898-1956), among others. Elmer Crowell’s early innovations and natural ability made him a top decoy carver of his era. Impressively, Crowell still holds the distinction of being the pinnacle maker today by virtually every market metric. While many other makers have historically gone in and out of fashion, Crowell’s works have stood the test of time, continually dominating the top of the decoy market. His carvings account for four out of the five top reported decoy sales. He is the only maker whose works have sold for more than $1 million. They have done so twice. On an institutional level, some of the top collectors of Crowell’s work include Heritage Museums and Gardens; the Museum of Fine Arts, Boston; the Peabody Essex Museum; the Ward Museum of Wildfowl Art; the American Folk Art Museum; the Museum of American Bird Art and the Shelburne Museum. Crowell masterworks are also found in some of America’s top private collections. The legend of Elmer Crowell and his famous carvings have many of the common threads of the typical artist’s tale. It is the story of an innovative boy of modest means, born at the right time and befriended by encouraging patrons. Crowell’s preeminence among his carving peers, a century of commendations from collectors in the field, his unparalleled sales records and the effort taken to restore his workshop all reinforce Elmer Crowell as the father of American bird carving. Through rare historical photos and well-fashioned narratives, the authors detail a vivid account of Crowell’s life on Cape Cod. Stephen B. O’Brien Jr, a fourth-generation sportsman with a collector’s eye, is co-author of The Art of Aiden Lassell Ripley and Masterworks of the Illinois River: Decoys from the Collection of Thomas K. Figge. Chelsie W. Olney is a freelance editor and writer. She graduated with honors from Brown University, double-majoring in English and Political Science. 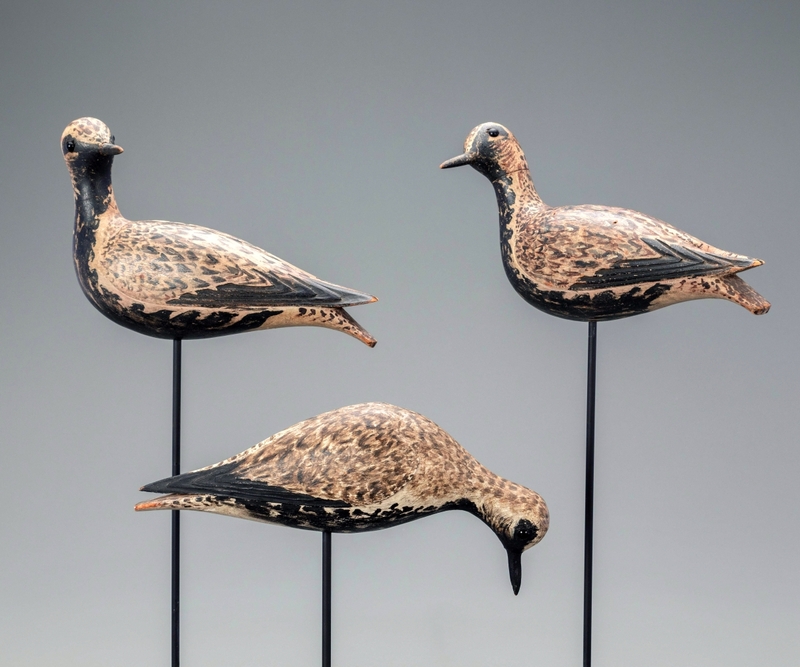 This trio of “dust jacket” plover, circa 1900, was featured on the cover of New England Decoys by Shirley and John Delph. Photo courtesy Copley Fine Art Auctions.